​Diamondhead Lions Club President Carl Necaise presents a $1000 check to Jim Collins, Executive Director of the Hancock County Food Pantry. These funds were part of the proceeds from the Third Annual Walk for Sight held this past October. As a class service project, the 4th grade class of Holy Trinity recently hosted a food fight among the classes to benefit the Hancock County Food Pantry. Each morning the fourth graders would collect and count items gathered in each classroom. 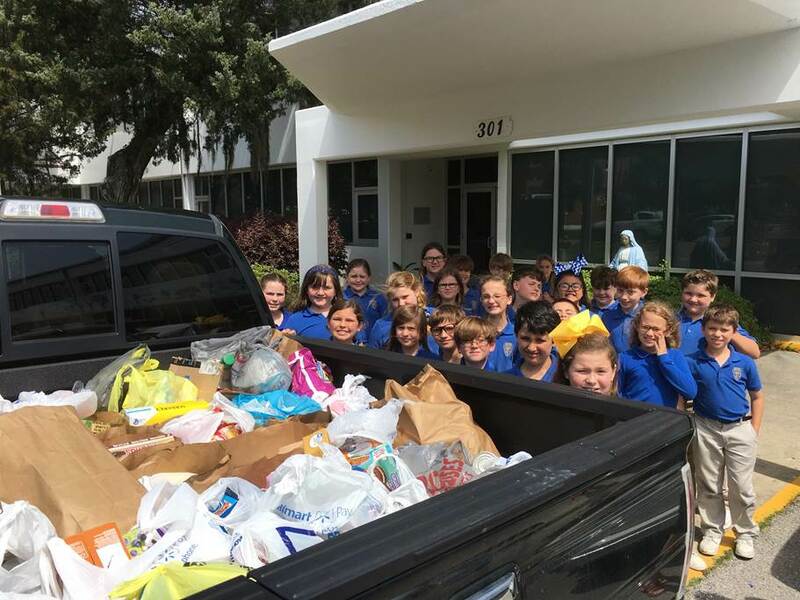 A total of 807 items or 647 pounds of food were collected, and though the competition was fierce, the 4th grade class claimed first place with a donation of 216 items. Holy Trinity is a Catholic elementary school for children ages 2 through 6th grade. ​Pictured from back left are Beau Rivage cast members Marie Twiggs, Johnnie Mae Applewhite, Lisa Labat and Roxann Reeves. 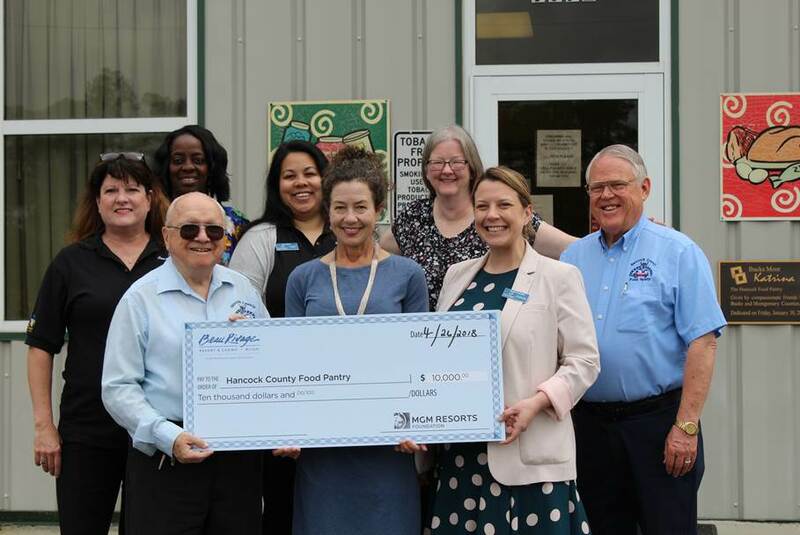 From front left are Jim Collins, Executive Director of the Hancock County Food Pantry, Marcie Baria, Chairman of the Hancock County Food Pantry Board of Directors, Sarah Cormier from Beau Rivage and John Wittliff, Treasurer of the Hancock County Food Pantry. When the Boys & Girls Clubs of the Gulf Coast, Hancock County Unit, learned that the Hancock County Food Pantry was in dire need of donations, the teen members of the Keystone and Torch Clubs – BGC’s internal Leadership Clubs - organized a club wide food drive to help fill the supply gap. The Boys & Girls Club members were able to fill several large tubs with 289 pounds of non-perishable food items. Members of the Keystone and Torch Clubs also visited the Food Pantry and helped with the unloading of supply trucks as part of their Community Service commitments. Slidell Moose Lodge 2038 and Chapter 1565 recently donated more than 800 pounds of food to the Hancock County Food Pantry. Representing the Moose Lodge and Chapter were Albert Biehl, Samantha Sones and Brenda Biehl. Shown are Diamondhead Councilwoman Nancy Depreo, Jim Beckham, Stephen Hicks, Bill Parish and Bailey Braswell. ​The Rotary Club of Central Hancock County donates a $1,000 check to the Hancock County Food Pantry. ​ From left: Hancock County RSVP Programs Director Linda Pitts, Hancock County Food Pantry Executive Director Jim Collins, Hancock County Senior Citizen Center Director Ariene Johnson and Barbara and Bob Huett. The Hancock County Senior Prom Committee recently presented a $250 check to the Hancock County Food Pantry. In October of 2018, a number of Food Pantry volunteers discussed the possibility of trying to raise enough money to purchase frozen turkeys and asking the community for its support. It’s been three years since the Food Pantry was able to afford purchasing frozen turkeys to give away to families during November because of the loss of some grant funding. There was a tremendous and outstanding response from the community during October and November. Donations were received from a number of churches, civic groups, businesses and many individuals. A couple even volunteered to match up to $3,500 if that much could be raised. All together, the community contributed more than $8.000. As a result of the generous donations from the community, the Hancock County Food Pantry was able to provide frozen turkeys to 760 Hancock County families in need during the month of November. It’s so gratifying to see that kind of response from the community, John Wittliff, Food Pantry Treasurer said. We need to say thanks to all in the local community. It was the community that responded and contributed to make it happen. East Hancock Elementary 2018 "Food Fight"
Starting from the left at the top row: Alivia Braithwaite, Ellysa Burkhart, Maddy Shippey, Addie Campbell, Isabelle Wright, Owen Hicks, Zach Ory, Braeleigh Landry, Christopher Hubbard. Next Row: Hannah Grogg, Aubree Rager, Shaylynn Whitfield , Ashtyn Burton, Hallie Galiouras, Ayden Clower. 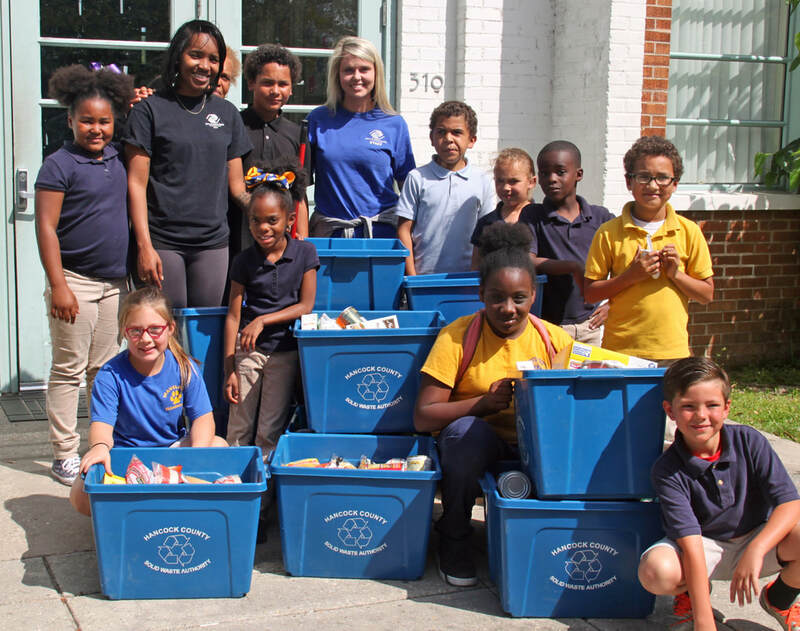 East Hancock Elementary in Kiln MS recently held its 2018 annual fall food drive, which is called a “Food Fight.” While learning civic responsibilities, students also have a contest to see which grades can bring in the most food/personal hygiene items. This year, students were most generous, bringing in canned vegetables, fruit and meat related items such as canned tuna and chicken. In the contest, students in grades K, 1 and 2 competed against each other for the most donated items. And grades 3, 4, 5 also competed against each other to see which class would donate the most items. In grades 3, 4, 5, Ms. Harris’ class won bowling passes. In grades K, 1, 2, Mrs. Courtalt’s class won the pizza party. The national standard for food drives is weight. This year, 2,178 pounds were donated, quite impressive for a school this size. Many thanks to Domino’s Pizza and Park Ten Lanes for sponsoring prizes. All items brought in for the “Food Fight” were donated to the Hancock County Food Pantry which is in desperate need at this time.